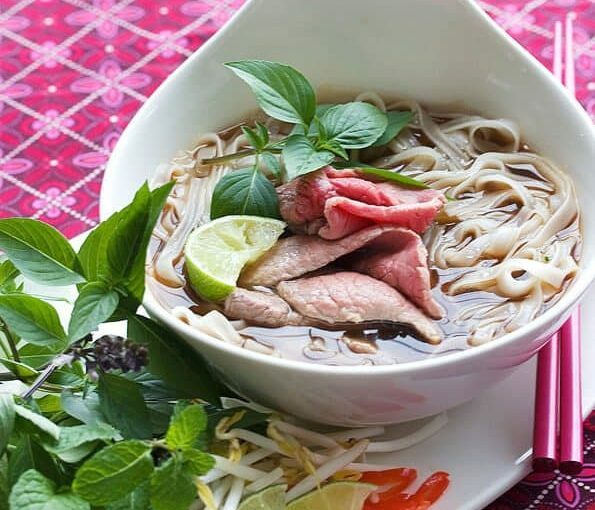 Have you ever tried making your own pho before? I was so intimated but I made some recently and it was actually pretty easy AND delicious! The broth is the most important part so don’t skip this step by using a box of beef broth – it’s not the same. Set baking rack 8 inches below heating element. Turn oven to low broil. Place the onion and ginger halves, cut side up, on a baking sheet. Brush the halves with a little bit of oil. Broil until the onion and ginger slightly charred, about 10 minutes, turning half-way. Remove from heat and cool. Parboil the beef bones: Fill a large stockpot (about 12 quart capacity) with water and bring to rapid boil. Carefully lower in the bones. Boil vigorously for 3 minutes to release the impurities. Dump bones and water into a clean sink, and rinse the bones with water to wash off any clinging residue. Quickly scrub pot clean and fill with about 6 quarts of clean water. Return bones to pot. Add the charred onion, ginger, spices, beef, fish sauce, and sugar to pot. Bring water to boil over high heat, and lower heat to gentle simmer. Simmer, uncovered, for 1 1/2 hours. While simmering, use a ladle or fine-mesh strainer to spoon off any scum that rises on top. At this point, the boneless meat should be slightly chewy, but not tough. Use tongs to transfer the meat to a bowl. Cover with plastic wrap and refrigerate. Meanwhile, maintain the broth at a steady simmer for 1 1/2 hours longer. Strain the broth through a fine-mesh sieve (or a coarse-mesh sieve lined with cheesecloth) positioned over a pot. Discard the remaining solids. Use ladle or fine meshed skimmer to skim as much fat as possible from the top of the broth. Taste and adjust the flavor with salt, fish sauce and sugar. There should be about 4 quarts (16 cups) of broth. If using dried rice noodles, cover them with hot tap water and let them soak for 15 minutes, or until they are pliable and opaque. Drain in a colander. If using fresh rice noodles, untangle them, place in a colander, and rinse briefly under cold running water. Cut the cooked beef across the grain into thin slices. Freeze the raw beef for 15 minutes, then slice it across the grain into very thin slices. Set all beef aside. Ready the raw onion, scallions, cilantro leaves for adding to the bowls. Arrange the garnishes on a plate and put on the table. To ensure good timing, bring the broth to a simmer over medium heat as you are assembling the bowls. At the same time, fill a separate large pot with water and boil. For each bowl, place a portion of the noodles on a strainer (or mesh sieve) and dunk the noodles in the boiling water for 10 seconds. Immediately pull the strainer from the water, letting the water drain back into the pot. Empty the noodles into a bowl. Top each bowl of noodles with cooked and raw beef, arranging the slices flat. Add a bit of raw onion, scallions, cilantro leaves to each bowl. The pho broth needs to be boiling hot, to cook the raw beef slices. Raise the heat of the broth to a boil. Do a final taste and make any last minute adjustments with fish sauce and sugar. Ladle about 2 cups of broth into each bowl. Serve immediately with plate of garnishes. Hello lovely readers! I just got back from the most wonderful vacation in Montreal and I am officially smitten with the city. It’s an amazing place that is SO vibrant in the summer! You really feel like you’re in Europe that times, how amazing is that? The streets are always alive and so many people walk and cycle. Lots of people drive too and traffic is horrible, I can’t imagine driving there. One of my favorites things I do was hike to the top of Mont Royal and watch the sunset. There were hundreds of other people up there doing the same, I was surprised by all the people actually! The walk up is so lovely and lush and the views at the top are gorgeous! Another must in Montreal is grabbing a bagel at one of the many bagel shops. 90 cents for a bagel fresh out the oven that doesn’t taste anythign like the bagels you buy at the store! There are also so many patios in the city and at 5pm everyone leaves work to grab a drink on a patio. It’s very common to go for drinks after work from 5 to 7pm, and if you walk by any patio in the city, you’ll understand why! I would highly recommend visiting Montreal! I was only there a few days but I hope to return for longer one day! Posted on June 21, 2018 June 20, 2018 Leave a comment on Vacation Update! I have a really delicious warming beverage I think you guys will LOVE! 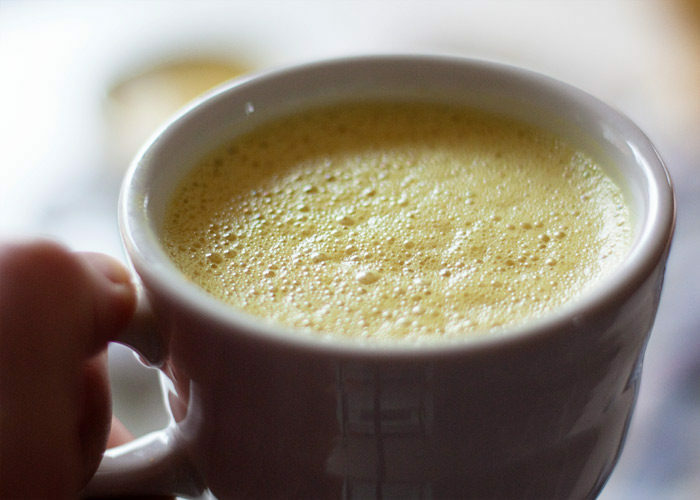 It’s called a golden milk latte and it made with turmeric, ginger, cinnamon, vanilla and the milk of your choice (I like coconut) and it’s so yummy and also healthy for you! If you’re like me and don’t really drink coffee but are also getting a bit sick of tea after months of cold weather this is a fun way to switch it up! You may have even seen a drink like this at your local coffee shop but those drinks are always WAY overpriced so I prefer to make my own at home. If you’re rushed in the mornings, save this drink for the weekend. It only takes a few minutes but we all know a few minutes can be hard to come by some mornings before work! Set a small saucepan over low heat. Add the almond milk, 1 teaspoon honey, turmeric, ginger, cinnamon stick, and black pepper and stir with a whisk until combined. Bring to steaming, just below a simmer. Do not let it come to a boil. Keep just below a simmer, stirring occasionally, for 10 minutes. Remove from heat. Remove the cinnamon stick. If you added other spices that need to be strained out, strain using a fine mesh strainer then return to the pan. Stir in the vanilla and coconut oil (if using). Taste and add additional honey if desired (I like about 2 teaspoons). Use a frother to froth the tea, if desired. Pour into a mug and spoon the froth over the top. Serve. Rainy Fall Days Call For Soup! It’s October and it’s raining. Fall is here – I get it! These cold dark days have me craving warm soup on the couch with a good book. I make soup a couple times a week in the winter and eat leftovers for lunch or freeze them for future meals. I just love how soup warms you from the inside! I made this butternut squash soup for dinner tonight and it was light yet nourishing – exactly what my soul was craving! I had 3 bowls 😉 If you’re looking for a new soup recipe, look no further! Tell me what you think in the comments! In a large stock pot , add butternut squash, carrots, ginger, and chicken broth. Bring to a boil, then reduce heat to medium and cook, covered, until vegetables are tender, about 20 minutes. Remove from heat and mix thoroughly with an immersion blender until smooth. Stir in coconut milk and season to taste with salt. Serve with a garnish of roasted beets, scallions, and a drizzle of coconut milk. Posted on October 19, 2017 October 20, 2017 Leave a comment on Rainy Fall Days Call For Soup! When it’s hot outside, the last thing I want to think about is cooking in a hot kitchen. No thanks! But I still want to eat healthy and nourishing meals – that’s where the summer salad comes in! Chop a few veggies, throw them in a bowl, add a light dressing, and voila! Dinner in less than 10 minutes. You guys know I’m all about food prep but I’ve been spending every free moment I have this summer enjoying the weather with friends and wine! So the last thing on my mind on Sunday is food prep. 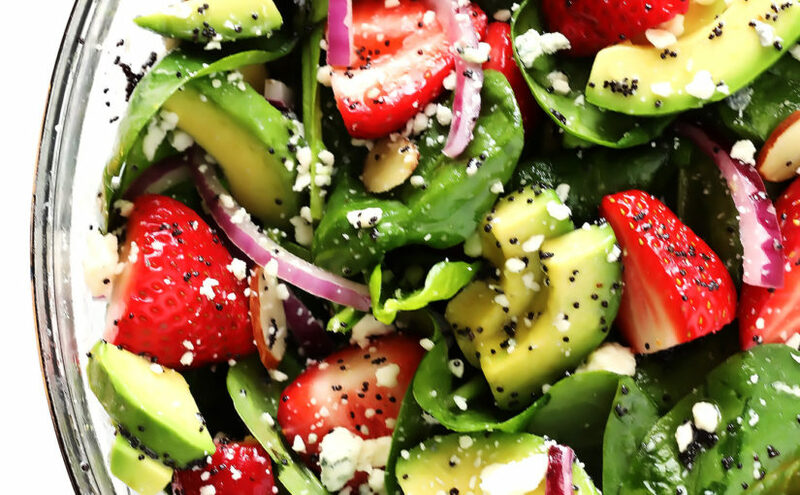 But when you’re making quick salads like this one it’s really not a big deal. I literally spend minutes throwing these together and I’ll often double the recipe and add half to a container for lunch before I add the dressing. Two meals in one?! That’s my kind of summer prep! Welcome to summer y’all! I’m so happy summer is here as it’s my favorite season. I love the sun and doing summery things like going the beach, riding my bike, getting ice cream…the list goes on LOL. I wasn’t able to take a vacation this spring as originally planned due to some financial constraints but it’s ALL GOOD cuz summer! I’ll go in the fall or winter hopefully, I will definitely let you know! After that, I’m usually POOPED! I spend about 3-4 hours doing all this, sometimes less if it’s summer and I’m doing more fast and easy recipes like salads. BUT all the prep is worth it because I have all of my lunches prepared and often most of dinners. Sometimes the prep requires a bit of light cooking in the evening like boiling noodles, or baking some vegetables but it’s so easy I don’t mind. So long as it’s no slaving over the stove for an hour, am I right?! Anyways, there is a chaotic look into my food prep life. I hope it inspires you to try something new! xo. You guys know how much I love food prep Sundays. Well cooking all day isn’t the most fun, but having healthy meals all week and not having to cook every night is the best! So I make it work LOL. Today I wanted to share an easy recipe to make in the crockpot or slow cooker. I let this simmer all day and then portion into various glass containers and jars for my work lunches and some dinners too. It’s a great soup for these cold and wet last days of winter. At least I hope winter is ending soon! I literally found so many recipes by Googling “healthy crockpot recipes” so give that a try to find a recipe that you love. This is a vegetable soup with lots of great winter vegetables and even some red lentils I found thanks to A Beautiful Plate. I’m not vegetarian, but I do eat a lot of meatless meals throughout the week. Please enjoy and tell me what you think! If you own a stovetop-safe slow cooker insert: Heat the olive oil in the insert over medium heat on the stove. Add the onion and celery and saute until tender, 5 to 7 minutes, before transferring to the slow cooker and continuing with the instructions below. If you do not own a slow cooker with a stovetop-safe insert (or wish to skip step one): Place the insert on the slow-cooker base (this recipe will fit a 4-quart capacity slow cooker). Add the olive oil, onion, celery, carrot, zucchini, potatoes, split red lentils, chopped tomatoes, parmigiano rind, bay leaves, thyme, chicken stock, kosher salt, and black pepper. Stir together. Cook on high heat for 4-6 hours, or until the red lentils are tender (or alternatively, cook on low heat for 8-10 hours). In the last hour of cook time (or 2 hours, if you are cooking over low heat), add the thinly sliced cabbage. Remove and discard the dried bay leaves and any tough thyme sprigs. Adjust the seasoning to taste salt and pepper – you will most likely need to be liberal on the salt for this soup! 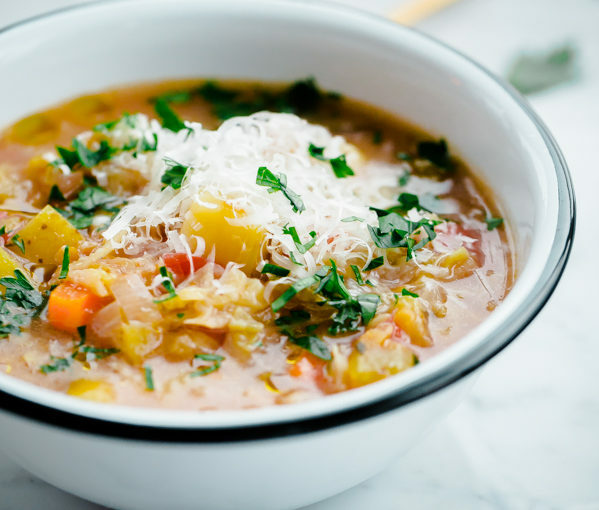 Serve the soup and top each serving with a drizzle of extra virgin olive oil, a sprinkling of freshly chopped parsley, and freshly grated parmigiano-reggiano. It’s been forever since I’ve taken a vacation but next year I’ve decided to take two weeks off in the spring for an adventure. I’ll be going by myself so I’m researching destinations that will be fun for a female solo traveler but also safe at the same time. I’m trying to decide between a more adventurous vacation or a more relaxing vacation. I find when traveling solo that the adventure vacations can be the most fun because it’s easy to meet up with other travelers along the way and travel together. The relaxing vacations are nice but sometimes it’s a bit too much alone time LOL. Right now my wish list includes Bali, Costa Rica, or Brazil. Lots of sun at every destination but each with a different pace. Because I only have two weeks, length of flight is also a serious concern. When I was in my 20s I would travel around the world on these long flights with long layovers but now I don’t have time for that. I want to get to a destination as fast as possible LOL. Here are a couple great blogs I found that I’m researching to make my decision on my final destination. 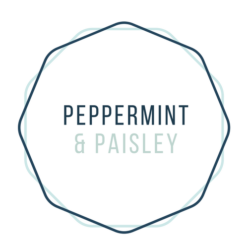 If you have any great resources you use for travel I’d love to hear about them! Posted on December 29, 2016 February 19, 2017 Leave a comment on Vacation Planning! OMG you guys. I have to tell you about this really cool present I got last week. It was my birthday and my super thoughtful older sister sent me this amazing gift in the mail that I would’ve never thought of. It’s a Tibetan singing bowl and it makes the most majestic sound I’ve ever heard. I’ve always loved music but I’ve always been more interested in bands and that sort of music. This is a spiritual type of music that people often used during meditation. When you hold the bowl in your hand and play it it creates these vibrations that run through your whole body. It’s hard to explain but it’s really cool! I’ve been playing mine when I get home from a busy day at work and I find it helps me calm down and relax. I transition out of work mode in the home mode very quickly LOL. After doing more research I see that there are tons of different sizes and materials for the singing bowls so I’m thinking of growing my collection. How cool would it be to have a Zen room filled with singing bowls? #ApartmentGoals. Do any of you own a singing bowl? I’d love to hear more ideas for how and when to use it! I’ve been trying to get on the food prep train and prepare all of my meals for the week on Sunday. I can be a challenge to buy all of the groceries in advance for a full week’s worth of meals but it’s totally worth it when you don’t have to think about cooking during a busy week. I decided I would share some of my food prep recipes with you in hopes of inspiring others to do the same. This Mexican Quinoa is one of my favourite go-to recipes I hope you enjoy. I’ll be sharing more recipe ideas very soon! Let me know if you have any requests!